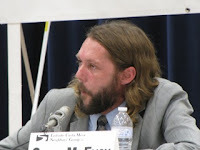 A BUBBLING CAULDRON: Final Candidate Forum "In The Can"
THAT'S IT - NO MAS Well, that's it! The final Costa Mesa City Council Candidate Forum is under our collective belts. And, thanks for the good work performed by my friends of the Eastside Costa Mesa Neighbor's Group, Inc., it was worth waiting for. My best guess is that around 160 -180 people attended the event at the Neighborhood Community Center - a good turnout. A fter a half hour of mingling and chatting, the meeting started on time at 7:00 as President Jeff McConville introduced his team, did a little fund raising and then handed it off to fellow Eastsider, Marnie O'Brien Primmer, to moderate the program. She did a great job. The script was followed with precision, the questions were carefully crafted and each candidate was provided just enough time to give a complete answer. It ran so smoothly that when I looked at the clock at 8:30 as they wrapped it up I couldn't believe the time had flown past so quickly. 3) How will they deal with the John Wayne Airport expansion? In response to the first question, Jim Righeimer suggested attracting high quality businesses. Sue Lester urged creating an environment to entice businesses. Chris McEvoy emphasized the need to promote small businesses and to maintain our Westside Industrial area. Chad Petschl suggested an aggressive marketing plan and Wendy Leece, citing Quality of Life issues, said residents must have priority over businesses. The second question was whether they would vote in favor of the LED lights a t Triangle Square if that question was brought back for consideration in January, McEvoy stated emphatically he would vote NO if the issue was returned for consideration. Righeimer gave a history of the issue and closed by stating that we don't make such decisions without a public hearing. Petschl was a little vague on this one. Lester also danced around the issue a little before stating she would vote NO. 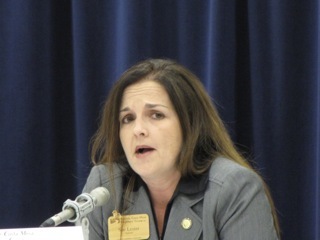 Leece emphatically stated that she wasn't going to support it and that she "didn't need a public hearing to decide it!" That seemed like a curious - and incorrect from a legal standpoint - answer for her to give. 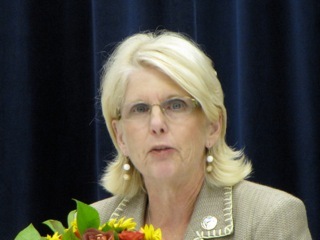 Responding to the third question, about the growth of John Wayne Airport, Leece spoke of her current involvement with community organizations fighting expansion of the airport, but stated she didn't want to see any growth. Lester echoed those remarks. McEvoy also indicated he didn't support ANY growth. Righeimer reminded the audience that growth is already happening at the airport, citing the expanding new terminal, and that it's not just a local problem. Poor Chad Petschl chose this question to display how completely out of touch he is with local issues. It's understandable, considering that he's a very recent resident to the area. However, to say that he "shot himself in the foot" when he answered that he favored adding a couple more runways at John Wayne to generate more business would be a huge understatement. It's unusual to watch a candidate for public office commit virtual Hara-Kiri on the dais, but that he did. You could hear a few gasps when he suggested that we should emulate Las Vegas and encourage MORE flights to and from John Wayn e.
I spoke with him later and he acknowledge that his response was a mistake, but he stuck by the logic. He's a heck of a nice guy and I really hope he does stay involved in city business. He's enthusiastic and energetic but completely uninformed about almost every important issue in our city. He could have a future in local civic events if he does his homework and gets up to speed on the issues. Right now most 7th graders on the Eastside probably know more about the traffic and John Wayne concerns simply by overhearing their parents speak about it. The questions shifted at this point, with each candidate being asked two separate questions in a random fashion. Sue Lester was asked about Banning Ranch, to which she responded that she was not in favor of ANY development at that site. She was also asked about variances for high density development, to which she indicated a need to work with the Planning Department and said we need more affordable housing. Jim Righeimer was asked about Recovery homes and how to limit their numbers. He responded that if they are six or less residents we can do very little . He indicated that some control can be exercised at the planning level if potential operators try to add a 5th bedroom - we require a 3-car garage, which increases the cost and affects the profitability of such places. He implied that if a "happy family" made application for that 5th bedroom perhaps the requirement for a 3-car garage would be overlooked. That one snapped my head around, because it sure did sound like he was saying he'd apply the rules differently, depending on the applicant. Makes me nervous thinking about what other rules he would apply so cavalierly. He was also asked about variances to the General Plan and kind of answered it with a mini-rant about lacking infrastructure, pointing to the Westside as an example. I'm not sure he ever actually answered the question. Chris McEvoy was asked about the 55 Freeway completion, to which he replied that he expects that the completion would resolve some of the cut-through traffic, also mentioning the Banning Ranch as a large negative influence on the Westside. He was also asked about the recent Orange County Register article that said Costa Mesa stood alone among OC cities by not turning a profit. He replied that he'd heard those numbers were incorrect and that the city had replied to it indicating that a profit, although small, had been made. 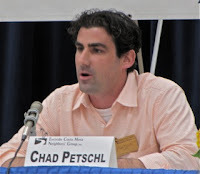 Chad Petschl was asked for his take on the traffic issues in the Eastside, to which he began talking about Banning Ranch and bike trails. He had no idea what the question meant. He was also asked about a "pedestrian-friendly town center" - again, no bells went off in his head. He spoke in generalities, unable to nail down specifics. No cigar on this one. Wendy Leece was asked about visual blight, but indicated that she didn't have an answer for it. She did refer to our graffiti program. She was also asked about the noise battle from the Pacific Amphitheater and talked about the long legal fight, then referred to Triangle Square and the recent noise issues with the Sutra Lounge. FINAL QUESTION - NUMBER 1 ISSUE? The interrogation wrapped up by asking each candidate what they felt the number 1 issue would be that they would face if elected. Wendy Leece led off by addressing the current condition of the labor contracts and indicated that the current contracts are a result of lots of negotiating by several different councils. While they need changing, she said we just can't "eat the elephant in one bite." She said we need to pay employees what they are worth. Chad Petschl indicated he has only been here a few months, but spoke of being the new guy and how he could bring fresh ideas, then referred to "washed up politicians", making a small gesture toward Righeimer, sitting beside him, then talking about needing to get the city humming again. Jim Righeimer said the budget was the number 1 priority, indicating that things in the city have changed and that he didn't know if we'd ever get back to where we were. He mentioned needing an ombudsman, then whined a little about being attacked by the police unions. He suggested a "bi-partisan" commission to assess the contracts. I thought at the time it was a strange comment, since our city issues are theoretically NON-PARTISAN. Chris McEvoy also said the budget was number 1, choosing a "hunker down" approach, taking our time to get things sorted out. He said he preferred a simple community. Sue Lester also said the budget was her top priority, stressing accountability and "sharing the load." She said something like, "If you want the same old thing, then vote for the same old thing", meaning the same old people. TERRIFIC FORUM All in all, I'd have to say this may have been the best forum of the series. Clear questions, with enough time to answer them, an excellent moderator and responsive candidates all contributed to the success. For me, one of the highlights were things that DID NOT happen. For example, neither the police union anti-Righeimer sign truck nor the threatened hooligans carrying booking photos of Chris McEvoy showed up. The former had been driven all over town and the latter was just an empty threat by deranged people. 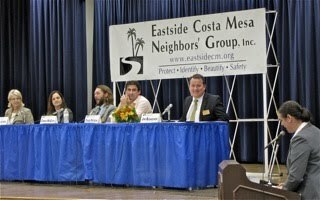 My friends of the Eastside Costa Mesa Neighbor's Group, Inc., deserve a lot of credit for presenting an excellent candidate forum. It's just too bad it couldn't have been televised. Oh, well..
Now the candidates will continue with the hard part of the campaign - walking the precincts, knocking on doors and telling your neighbors just why they deserve their votes. Sadly, I suspect we will see some more hi-jinks from the po lice union and also those folks who recognize that Chris McEvoy actually has a chance to defeat Righeimer, so they are attacking him. Desperate folks do desperate things. This has been an extremely nasty campaign so far and, with a couple weeks to go, I don't expect to get any better. Great coverage, exactly what was said. After hearing Riggy say that "Costa Mesa does not have an income problem" I could not stop wondering what this guy is thinking. It is very obvious that he is using CM as a political stepping stone. Leece, and her Polyanna viewpoint is still not grasping the severity of things in town. She is so happy to live here. She must need new glasses. I thought Righeimer's committee solution to police compensation showed leadership, whether he meant bi-partisan or non-partisan. It's a good way to get the politics and nastiness out of the process. You forgot to mention that Petschl mentioned the voting date as Nov. 3rd when it's actually Nov. 2nd. Barbara Venezia hit the nail (or Petchl) on the head with the comment: "Chad Petchl is good looking, but he should be sitting in the audience. At this stage in the game he should a have better understanding of key issues." Good recap Geoff. Steve Mensinger and I had a good chat after. Nice to see Rob Dickson there. A new CM resident was in the audience. I have not had a chance to get her take on the candidates yet. Bruce, thanks for your comments. I did read Barbara's column yesterday online and agree with her observation about Petschl. I did see you chatting up Mensinger. He and his lapdog, Fitzpatrick, must have come in late from Mansoor's fund raiser with all the OC GOP big dogs. It was clear from last night's forum that Righeimer has the best grasp on the needs of Costa Mesa going forward. Like him or not, Righeimer dominated last night, plain and simple. His grasp of local issues and needs is spot-on. Most people didn't go to or view the Planning Commission meeting where the LEDs were approved, including the candidates commenting on it, so they didn't know what was discussed or what was even approved. Taking Righeimer to task for not stating whether he'll approve or deny - when he will likely be one of the decision makers and no public hearing has occurred, was inappropriate. I'm also impressed by Righeimer's refusal to let the mud-slingers of the CMPA define him. We need to look at public employee compensation, as the existing model is based on an economic model that no longer exists. His proposal to have a commission look into public safety pay and benefits is great. McEvoy, like him or not, just doesn't get it. Pulling our collective heads into our shell in response to the budget crisis won't work. Bringing a new way of thinking about problems to the table is great, but you have to recognize the problem in the first place. Shunning national retailers is just dumb, especially in a city that lured Ikea away from Tustin and has the best shopping mall - chock full of national retaliers - in the nation. Those businesses employ thousands and contribute heavily to our tax base! He is right about small businesses being job generators, and we should do everything we can to encourage small businesses. But we don't need Chris McEvoy of the Council to do that, we already do. Our entire business climate fosters entrepreneurism. If you take the future of Costa Mesa seriously, you should not vote for the really nice, sincere guy with no plan and a lot of platitudes. Sorry, but that is reality. I know that my comments will be taken in context - I support Righeimer, and for good reason, as evidenced by last night's forum. I urge those of you who were there and who support McEvoy to give serious consideration to my points about McEvoy's answers. I've scoured his website and heard everything he has said at every forum, and I like him, but he hasn't given me any reason to believe that he has a solid grasp on the reality of our issues, and he certainly doesn't have a plan. If I'm wrong, and I've missed something about Chris, please let me know. Geoff, I forgot to say - great post, excellent recap, you really captured what happened. Bruce, great to see you and your lovely wife. It was also nice to see Bill and Linda Sneen. Righeimer displayed the best grasp, again, of the issues. That's not ever been an issue with me, as you know. It was good to see you again - glad you're still immersed in city issues. You're always welcome here. By the way, you submitted that first post twice, so I rejected the second one. Might be you, or it might be Blogger, which sometimes has taken on a life of it's own recently. Don’t think Geoff has a hat big enough for all the complements boyz; but yah, he did an excellent job on the recap. I however had to ask the question that I have not heard ask or in print; so I asked each one (minus James because I already knew how he would answer after a short conversation at the Mesa Verde forum). McEvoy would like to see the third runner up get the knod. Lester doesn’t think anyone should be appointed to any office, she made reference to that while answering one of her questions. She would like to see someone who was experienced ( a past Council Member) and has been selected by the people at some point. Petschel was in the middle of his answer when an obnoxious, pot stirrer step into my conversation. Chad hinted at following the in-place norm, he was more concerned about his answer to the Airport question. Leese noted that she had no problem with each Council member make his/her nomination and the voting for one the 4. It was also her understanding that Foley would not be stepping down and Wendy also didn’t think anyone is planning on contesting Katrina holding both offices. I then put the question and this scenario to Wendy, “If James wins, Foley steps down, who will get the nod?” She smiled. Then I put this to her, “If Righeimer wins, Foley steps aside and Mansoor loses, will we be seeing him back on the dais?” (HEE,HEE, HEE) It could happen, y’all! Your question is an intriguing one, isn't it. Actually, I'm not sure Mansoor could be appointed. I think he has to sit out one cycle - two years. It's always fun to fantasize, though, isn't it? :-) In the past when a vacancy occurs the choices are a special election - which is too costly to happen at this time - or an appointment. Typically, a solicitation for interested parties occurs. They submit applications, which are vetted by the City Clerk for eligibility, and then presented to the Council for selection. It has been a circus sometimes - when Eric Bever and Mike Scheafer were the last two standing and 2-2 votes kept happening. Bever finally took the high road and stepped aside so Scheafer could be appointed. Might have been the last good thing he did on behalf of the city. The list of "candidates" is long and conservative. Mensinger, McCarthy, Mathews and (lord save us) Fitzpatrick, for starters. A council without Foley will mean a runaway freight train without a brake - no way to slow it down once it gets going. It would cease being a "council" and become a de facto junta. Sad day for us all if that happens. Rob, Chris spoke of his plan last night and in his run two years ago, he will attempt to be the voice of reason; if he will be successful or not, only time will tell. I have watched Chris speak at almost every Council meeting, also at a large number of Planning and other of our fair cities committee meeting over the past 4 years. He has made concise points on almost every issue brought forth, in the last 2 years he has ALWAYS brought a point of view from the streets, not just what was popular at that time. Do you understand how difficult a task it is when “We the People” get only 6 minutes, that’s right, SIX MINUTES a month to voice our concerns? As for Jimmy, he’s the poster child for the “Typical” politician; looking for the ladder to his next endeavor. E-V-E-R-Y-O-N-E needs to remember that Righeimer has only lived in Costa Mesa for about 6 years. He had lived in our fair city less than two years a made a run for Council. He lost. Then within weeks he is appointed a seat on the second (or maybe even the most) powerful decision making panel we have. Why did he move to Costa Mesa after living in Fountain Valley for a long time? Why would he have not been successful running there? Maybe he found the ladder he was looking for. I will stop here to say, “I am a staunch Republican, I worked on Reagan’s campaign (both time at Mile Square Park) and also on the Dole campaign. Righeimer in no way represents me or my views on how Costa Mesa will get out of this mess we are in. When we vote next month we HAVE to remember, most of the problems we have were voted on over the past 4 years, in most cases 3-2; the “Conservative” majority passing a very high percentage of the bills which are biting us on the tosh today. Two of those “Conservatives” will be here for two more years. That concerns me, A LOT! I appreciate that you support Mr. Righeimer. You certainly make your point and appear to be a very reasonable person. Think about it from my perspective for a moment. I understand that these are different times, and business as usual will probably not continue to work into the future. There need to be some adjustments. What those look like and how it will pan out is just an unknown. I'm not a faceless drone who punches a clock here and heads home elsewhwere. What is being bantered around is my livelihood. You have to ask yourself: what is having a well trained cadre of professionals to protect you and your property worth to you? 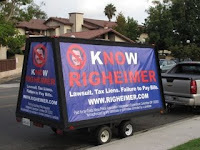 There is no doubt that Mr. Righeimer is well spoken, and he has a good grasp of the local issues. However, what he lacks (in my opinion) is an true understanding of community. He has never lived in any one place long enough to get that. He has no real ties to this community, other than those he has superficially created, to further a political career. The fact that he has moved from town to town, to gain a political foothold is evidence of that. Am I to believe that his intentions are purely altruistic in nature, and he only wants to improve this city in the long term? I honestly don't believe that. He is looking for a career change. From businessman to career politician. He will use this city only as long as it takes to springboard himself to higher office. As far as the "mud slinging" goes, that's truly nonsense. Look, I had to allow an investigator to crawl into my background to EARN my position with this city. Nobody got to just vote me in without knowing EVERYTHING about me. They interviewed my former neighbors, roommates, teachers, they checked my credit, pulled my military records, spoke with former employers, I took a psychological evaluation. All for good reason. The public puts a great deal of trust in me, and the city staff had to know that I was worthy of such trust. Everything they looked at was a story of my past behavior, and therefore an excellent indicator of my future behavior and character. Once properly vetted, I had the chief and command staff go through the findings and decide whether I was what they were looking for as an officer in this city. Mr.Righeimer would rather forget his past, as it can certainly be viewed as unsavory. I submit that Mr. Righeimer's arrogance, and lack of real acknowledgment of the issues of his past are an indicator of his character. He would rather avoid the issue and shoot back with his rhetoric and side step the issue and put the blame on the officers for exposing him for what he truly is. Knowing what I (we) know about him, I do not feel he is worthy of my trust. He can ask all the questions he wants about compensation, pensions, any of it. Again, I agree that some changes have to be made and will be made. I do not feel the man is reasonable, and I do not feel he is ethical or honest. I don't want a candidate who is just looking to use this city to punch his political ticket. I certainly admit that I have something at stake here. But I have to look at it through two lenses; that of a lifelong resident first and foremost, and that of an employee. I want everyone to NOT vote for Foley for School Board; that would take the option off of the table. I wonder how much time will be spent "Challenging" Foley holding two seats at one time. As if we don't have anything else better to concentrate on once the new Council is embedded. My better half made an interesting observation, “ If Foley is so much about her children that she would be holding an additional seat (School Board), also her day job; how much quality time will she be sacrificing for those children she is doing all of this for?” Not my words, this comes from a mother who missed a lot of parades, softball games and field trips because of running her own company. 1. The total site signage, including the LED signs, shall not exceed the total sign area allowed under the Planned Sign Program (3,445 sq. ft. for the entire center). 2. Permanent window signs shall not exceed 20% of the contiguous window area per the City’s Sign Code. a. The LED signs shall not exceed 300 nits in luminance during the evening hours. b. No flashing or animated displays or images on the LED signs shall be permitted at any time. c. The operating hours of the LED signs shall be 7:00AM through 11:00PM, Sunday through Wednesday, and 7:00AM through 12:00 midnight, Thursday through Saturday. Beginning one hour prior to the end of the above operating hours, the LED signs shall be gradually dimmed until they are completely turned off. Outside these approved hours, the LED signs shall be turned off. 13. 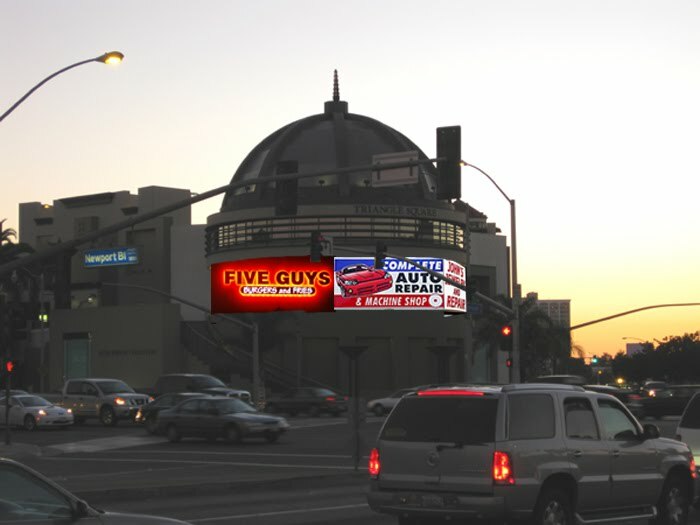 No third-party off-site advertising shall be permitted on the LED signs. 14. Images on the LED signs shall not change at a rate less than once every four seconds. 15. 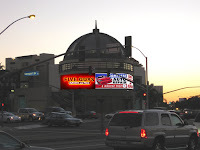 Images on the LED signs shall consist of tenant names, logos, and public service messages only. Thanks for the detailed response. I sincerely appreciate your weighing in and using your real name. I've lived in the Newport-Mesa area since 1979, and in Costa Mesa since 1993, I know the community and I want to keep the trained cadre of professionals that we have. I've posted here and elsewhere about my appreciation for the men and women of the CMPD, and how I do not think that CMPD/CMFD are responsible for the budget problems, or that their salaries are too high. Also, and I think that this gets lost in the fray, the MOUs, pension formulas, OT utilization, salary schedules, etc. - every aspect of public safety pay/benefits was agreed to and endorsed by the City Council. I have no problem with the CMPA advocating for the best deal they can get their membership. I do the same thing with my employer. 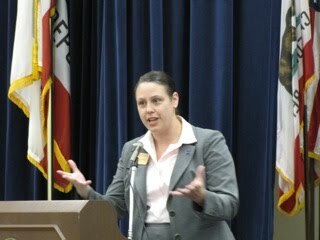 I have also stated my specific areas of concern, pensions and OT - though the OT issue is mainly a fire department issue. I am acutely aware of the fact that this is your livelihood we are talking about. I understand the frustration and even anger. I work in the legal field, and during the worst of the economic crisis, people on industry blogs commented endlessly and in great detail about layoffs and pay issues that were directly impacting us. I have to disagree with you about the mud-slinging. I completely agree that we should know about the qualifications of the people vying for public office, but I do not see the CMPA doing a detailed investigation on every candidate. CMPA went after the one guy who wants to make pay and benefits a campaign issue, and they took the low road. Mr. Rieckhof's council comments after the DUI incident were totally inappropriate, and the implication that Righeimer didn't care about drunk driving was way out of line. Subsequent disclosures about another candidate's history, and the CMPA's silence on that issue, further reinforces my point. CMPA could have taken the high road, after all, the community truly respects and appreciates you guys. I know that I do, and that isn't BS for the sake of a blog post - I really mean it. There were other ways they could have made their concerns known. If you disagree, please let me know why. I can't argue with your personal opinions about Righeimer as a candidate or a person, they're your and you have obviously given them a great deal of thought. As for his true understanding of our community, he has a much better one than Ms. Lester and Mr. Petschl. Mr. McEvoy is a life-long resident, but I question whether he really understands what the community needs to recover from the economic crisis. You may be right about Righeimer's ambition and Costa Mesa being a stepping stone to higher political office, but this is where his home and family is. Like it or not, he is part of our community. Whether or not he moves on, and that is speculation, I think we need someone who can get things done now and will work to improve our revenue situation. If he does good things in Costa Mesa and then moves on to the legislature, how does that hurt us? 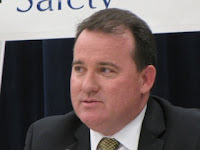 I am basing my vote on who has the best grasp of the issues facing Costa Mesa, and what is best for Costa Mesa. Decimating our police and fire departments, destroying morale, and leaving them underfunded and with poor equipment would be bad for Costa Mesa, and Righeimer is a smart man who knows that leaving Costa Mesa worse off will not reflect well on him. Everything else aside, his committee idea is a damn good one, in my opinion. Thanks again for the dialogue, and thanks for keeping us safe. Rob, to me, a committee is a complete waste. City staff (human resources) is already paid to deal with labor negotiations. City council is elected to give the city staff guidance on how to deal with those negotiations. Now, Righeimer, a republican running on a "government is too big and the police are overpaid" platform watns to in essence, make another bureaucracy. How about he does his job? He has made it a point that he wants to go after the police... I question why he is shifting his tune here. Possibly he is polling and finding his viewpoint is not shared with the majority of Costa Mesa voters? Possibly he has fallen behind McEvoy? Uh oh Righeimer!!!! Trouble, trouble, trouble, for you. Jim, if the committe involves members of the public and lifts the veil of secrecy from the negotiations, I think it would help. Normally, the negotiations take place between the association negotiation team, and appointed negotiation team from the city (usually involves HR, finance and has also included an attorney in the past). Once both parties reach a tentative agreement, they take it before the council for a vote. To my knowledge, council has not normally been this involved in the "front end" in the past. Not to say it's unprecedented though. of course, the city was willing to designate this committee as their negotiation team. The negotiation process is incredibly structured and is a two-party process. The employees and the city. Bottom line: It's a great political red herring. Rob you forgot to mention that a committee of the type suggested by Righeimer would be in violation of MMBA as well as a waste of space.